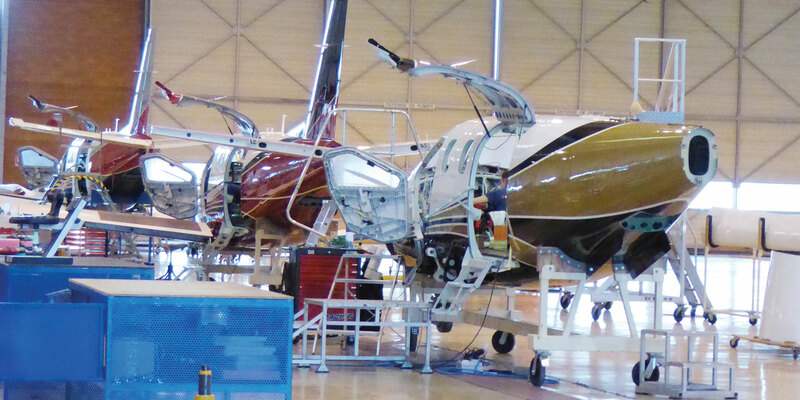 Left, the TBM 900 assembly line in Tarbes. Below, a fuselage awaits mounting of the PWC PT6. The aircraft was announced in April 2014; the 100th copy will be delivered next month. Since Daher took full control of Tarbes-based manufacturer TBM last year it has invested heavily in the modernization of its facilities. Not only has the TBM 900, the latest generation of its single-engine turboprop, outstripped expectations, but its third-party work has gone from strength to strength too. Beyond former shareholder Airbus, for which it produces all the A350 main-gear doors, it also has a significant amount of work for Dassault, Gulfstream and Embraer. AIN visited the TBM factory in early October, as part of a tour arranged for IAOPA (The International Council of Aircraft Owners and Pilots Associations), which was holding its European regional meeting in nearby Lourdes. It was evident that this is a manufacturer that is full of confidence; some 25 years after the TBM 700 entered service the 900 has boosted the type’s fortunes, especially in the U.S. market where TBM started out life as a joint venture project (TB for Tarbes and M for Mooney). According to spokesman Philippe de Segovia, “We have delivered so far 40 TBM 900s since the beginning of the year for a total of 51 orders to date. We have scheduled five deliveries in November and six in December. Out of the 40 delivered, three were sold in Europe, five in Brazil, two in Mexico and 30 in the U.S. In December we will deliver the 100th TBM 900.” In 2015, other milestones included delivery of the first Spanish and the first Mexican TBM 900s. Here at NBAA, Daher (Booth C13307) said it has a “special offer for Part 135 operators…as we see a strong interest from very small commercial operators.” One such operator, Eric Walden of Little Hawk Logistics, is the company’s guest speaker at its NBAA 2015 press conference. Walden is based in central Virginia and owns a 2007 TBM 850. Since buying the airplane in June, he has flown 300 hours. At the time of the Tarbes factory tour, TBM representatives were preparing for the 12th Convention of the TBM Owners and Pilots Association (TBMOPA) at South Carolina’s Charleston Executive Airport (held October 7 to 11). This saw a record attendance of 104 TBMs, which included 20 TBM 900s and the remainder TBM 850s and TBM 700s. The event attracted almost a quarter of the North American TBM fleet. This year topics included ADS-B, training, the TBMOPA Foundation’s scenario-based training initiative, a Pratt & Whitney Canada engine update and a safety review. Among the 2015 gathering’s highlights was the presence of two French Army TBM 700 pilots who flew one of the service’s aircraft from their Rennes, France base, marking the 20th anniversary of this cornerstone TBM version’s service entry in their unit. Featured speakers at this year’s event were retired Col. Mark Tillman (who related his experiences as the former Commander of Air Force One, the U.S. presidential jetliner); NASA astronaut Storey Musgrave and Dr. David Strahle discussing pre-flight weather planning and the Nexrad weather network. Joining the guest speakers was a well-known orator for many TBMOPA members, famed ferry-pilot Margrit Waltz, who has circled the world in TBMs. “Year after year, the TBM gathering continues to improve in quality as well as numbers of attendees, and we are proud to bring our support to this high-level flying community,” commented Nicolas Chabbert, senior vice president of the Daher Airplane business unit. Next year’s convention will be held in Phoenix, Ariz., from September 21 to 25. Among the speakers at the IAOPA meeting was Christophe Robin, Daher v-p of engineering and chief designer of the TBM 900. (Christophe is the son of the founder of Robin Aircraft, producer of the most popular light pistons in France). He took a swipe at the regulatory approach in Europe, where, he said, “they just took the rules for big aircraft and applied them to little ones.” He questioned why so much time has to be spent on certifying aircraft when “it’s not where the accidents come from.” He maintains that regulators should put more emphasis on pilot training, as pilots are usually the cause of the accidents. Robin said Europe’s GA industry is looking forward to the new less-onerous certification regime for smaller aircraft that is being formulated by EASA. Effectively, a philosophy that started with small aircraft is gradually working its way up, with Europe more recently coming on board–and this is being discussed as part of the new bilateral agreement between EASA and the FAA. Robin concluded: “Today making light aircraft is almost impossible as the cost of certification is disproportionately costly. If you bring certification costs down it will bring the others into the market. In recent years small aircraft makers have been forced to go to bigger aircraft–jets,” he said, and that has not always led to success.